Apple's full-sized iPad may have a brand new name, but the company's fifth iteration is all about refinement. The iPad Air is thinner, lighter and smaller than the previous model, but still manages to retain the same 9.7in screen and ten hour battery life. If you already own a fourth generation iPad the iPad Air certainly isn't an essential upgrade, but for everyone else, this is a clear winner in the large tablet market, and perhaps the best consumer-based tablet ever made. 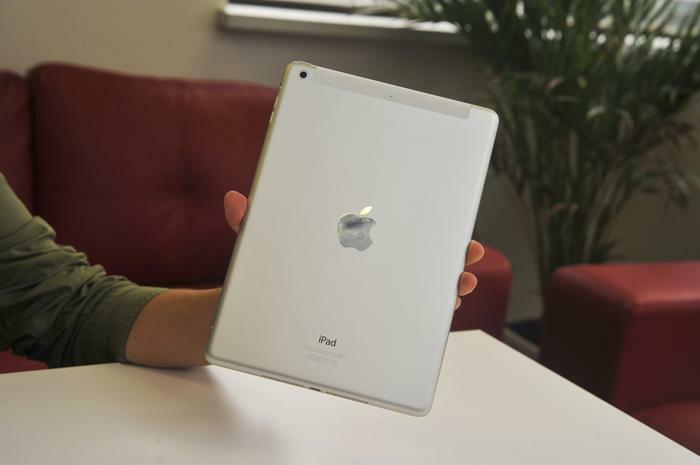 The iPad Air is all about slimming down. 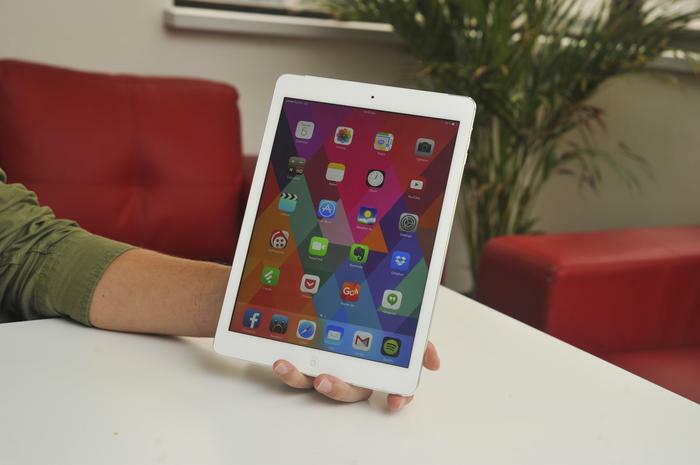 The iPad Air represents somewhat of a new era for Apple's largest tablet. Where the 3rd and 4th Generation models actually became heavier and thicker than the iPad 2, the iPad Air is all about slimming down. The formula appears to be very simple: the iPad Air looks like a larger iPad mini, utilising the same small bezel, chamfered edges and curved corners as Apple's smaller tablet. Like the iPad mini, it's available in two colours: silver & white, and space grey & black. While the iPad Air may look as simple as enlarging the iPad mini, retaining the same sized screen and battery life is anything but. The device is 28 per cent lighter (469g) and 20 per cent thinner (7.5mm) than its predecessor and Apple now calls it "the lightest full-size tablet in the world". Who is going to argue with that? By far and away the most comfortable, full-sized iPad yet. Apple tends to make a big deal of minor changes, but the iPad Air definitely lives up to its name. The reduced weight makes it significantly more comfortable to hold than its predecessor in both portrait and landscape orientations, and the narrower bezel means you can easily use it with one hand. The larger screen size still points towards it being a two-handed device, but the Air is by far and away the most comfortable, full-sized iPad yet. Critically, and very predictably for Apple, the downsizing of the iPad Air hasn't come with any significant compromises. Build quality remains superb, highlighted by a smooth, aluminium finish on the back, polished, chamfered edges, and laser cut speaker holes on the bottom, either side of the Lightning port. It remains to be seen how the chamfered edges hold up after a few months of use given they are susceptible to chips and scratches on the iPhone 5, but we didn't have any issues during our test period, and our original iPad mini has held up well. We long for the option of a matte screen. One significant disappointment is the lack of a Touch ID-equipped home button, which was first introduced on the iPhone 5s. The iPad Air includes Apple's regular home button instead. While a fingerprint sensor would be more often utilised on a smartphone, we feel it would certainly be useful on any iPad, especially as it negates the need to continuously enter your Apple ID password. Another slight annoyance is the speakers on the bottom: their position means your hand muffles them when you're holding the iPad Air in landscape mode. The iPad Air's display remains unchanged from the two prior models, but that's certainly not a bad thing. The 9.7in IPS screen has a resolution of 2048x1536, giving it a pixel density of 264 ppi. There's really nothing new here — viewing angles are superb, colours are bright and accurate and text is super crisp and clear. Our only real complaint, as with previous iPads, is the reflective, glossy surface. This can often make it tough to see in direct sunlight, and is even reflective under fluorescent lighting indoors. We long for the option of a matte screen, similar to what Apple offers on its MacBook Pro laptops. 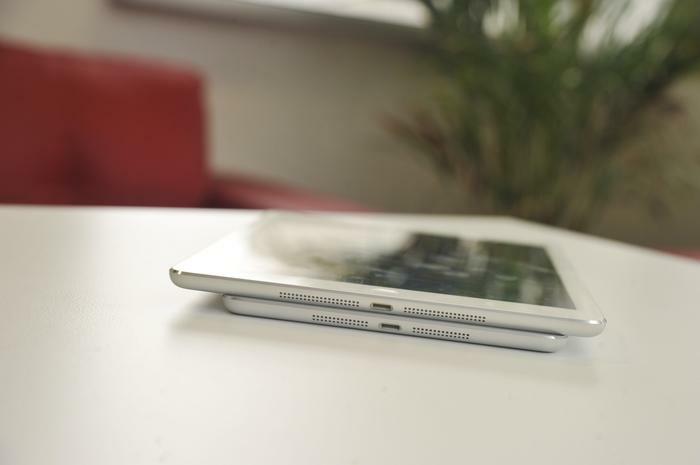 The iPad Air (top) is basically a larger iPad mini (below), utilising a very similar design. 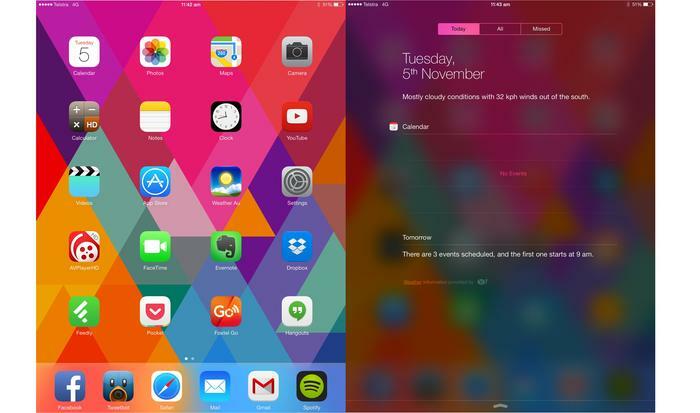 The iPad Air obviously comes with the newest version of Apple's mobile operating system, iOS 7. New features include a completely revamped user interface, AirDrop wireless sharing, and an all-new Control Centre. iOS 7 has received mixed reviews but we think it's a significant and welcome upgrade overall. The bright colours and light menus do take some getting used to, and some of Apple's icons are just strange but overall, it's a significant improvement from iOS 6. The control centre, accessible by swiping up from the bottom of the screen, is without a doubt the most useful new feature. It eliminates the need to delve through the settings menu to access commonly used functions like Bluetooth and Wi-Fi, allows you to quickly adjust the brightness, and has shortcuts for the camera, timer, do not disturb mode, and orientation lock. The latter is very handy, particularly when using the iPad Air while lying in bed. Apps open almost instantly, games are smooth and fast. A new addition to the iPad Air is Apple's decision to make its iWork and iLife apps available for free. The list includes Pages, Numbers, Keynote, GarageBand, iPhoto and iMovie. iCloud integration in the iWork apps will certainly benefit Mac users switching between these apps from an iMac or MacBook, while the apps themselves have all been revamped for iOS 7. Given these apps would normally cost over AU$42, they're certainly a nice bonus for iPad Air owners. The iPad Air has the same updated A7 processor first introduced in the iPhone 5s. It's certainly fast — apps open almost instantly, games are smooth and fast and general performance certainly feels snappy. Graphically intense game titles like Infinity Blade III and Real Racing 3 in particular are a nice showcase for what the iPad Air is capable of, but you do get the feeling that there isn't an app that has yet pushed the A7 processor to its limit. The real advantage of the A7 processor will come in the coming months, as more applications are developed to take advantage of its power. The multitasking menu doesn't work as well in landscape mode. 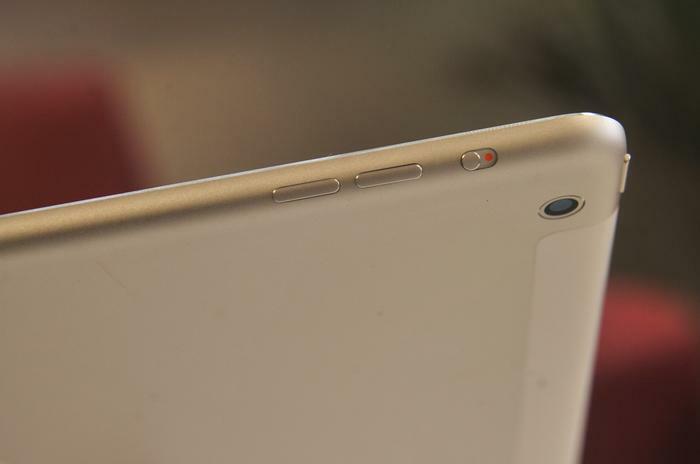 Apple has upgraded both the rear and front cameras on the iPad Air. The rear iSight camera has a 5-megapixel lens, dual microphones and records 1080p video, while the front-facing FaceTime HD camera has a 1.2-megapixel sensor and can record 720p HD video. Facetime calls are a little clearer than previous iPads but the changes aren't hugely noticeable if you're comparing the two directly. Photos captured with the rear camera are of poor quality when compared to most current smartphones, though we suspect most users of the iPad Air (or any other large tablets) won't be too concerned. The iPad Air retains a 10-hour battery life, the same as the previous model. In our testing we found these claims pretty close to the mark and often experienced just over 10 hours of battery life. Even with heavy use consisting of Web browsing, video watching, music listening, the odd game and constant email, the iPad Air easily pushed through a day and a half of use. It's a result that most of its competitors can't match, and it's even more impressive when you consider the updated processor and the much smaller frame. Apple has considerably slimmed down the iPad Air, but it hasn't come at a cost of battery life.